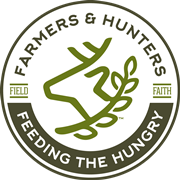 Butchers and Feeding Programs - Farmers and Hunters Feeding the Hungry - Hunt Down Hunger! Local butchers and feeding programs are welcome to contact us about participating with the FHFH ministry! We encourage you to connect with your nearest FHFH representative. Click here for a listing of our local chapters and coordinators. If we don't have someone serving your area, please email our national office, or call us at 866-438-3434 for more information. Meat processors must already be inspected or be willing to have a facility inspection performed. Inspection may come from local, state, or federal (USDA) levels. Wild-game processors typically do not have to be inspected to operate in most places. However this is a necessary step for participation with FHFH. Participating meat processors must also carry their own general liability insurance. FHFH raises financial support to pay for the processing so that hunters, farmers and feeding programs may participate at no charge. We do ask participating butchers to provide a discounted rate when processing donations for FHFH. Food banks, food pantries, soup kitchens, and feeding ministries are asked to submit a request to participate on their organizational letterhead if possible. You will be connected with your closest participating butcher(s) who may contact you when donated meat has been processed and is ready to be picked up. Thank you for your interest in participating with the FHFH ministry to help feed the hungry of your community!